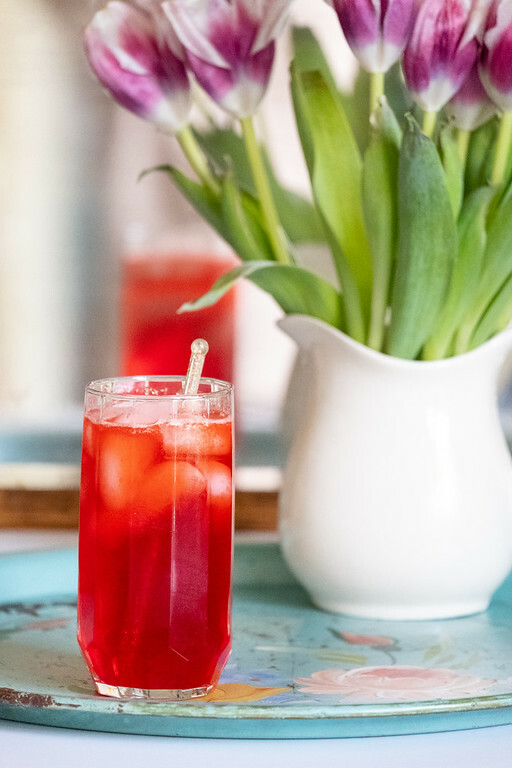 This pretty pink Sloe gin cocktail features sloe gin, lime juice and sparkling water. It’s sweet, pretty and a tasty low alcohol cocktail. 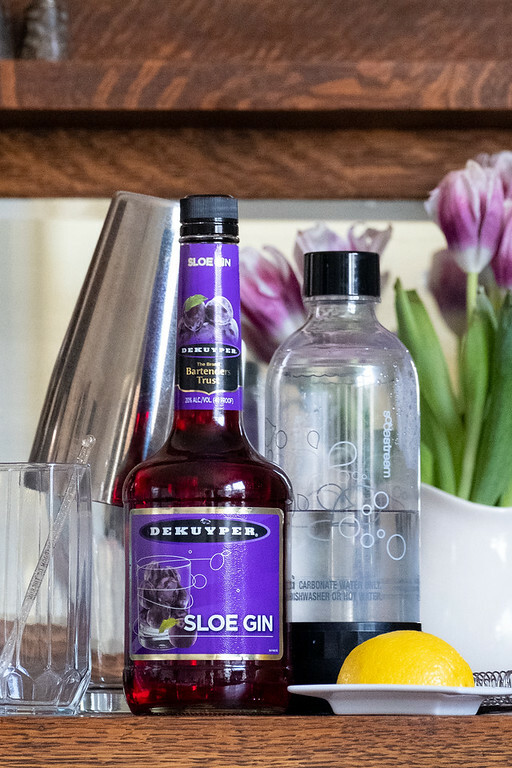 Click here to pin this Sloe Gin Collins now. I read last week that low alcohol cocktails are trending right now. The beauty of low alcohol drinks is that they are perfect for day drinking – think brunch or lunch or lounging by the pool or cuddled up by the fireplace. Personally I am a lightweight when it comes to alcohol, two beers and I’m ready for a nap. So, I appreciate a good low proof cocktail. Using an American sloe gin, besides making it pretty, brought down the alcohol content. Sloe gin is 20% alcohol, 40 proof – compared to gin which is 47% alcohol, 94 proof. Sloe gin is gin that has had sloe drupes steeped in it. Sloe drupes are a fruit similar to plums. In general there are two types of Sloe Gin that you can find at the liquor store. One that costs about $15 dollars and one that costs about $35 dollars. I have no doubt the more expensive (and higher in alcohol version) is a more truer version of Sloe Gin. However, I was just looking to make a fun, light, easy sipping, pretty cocktail, so I went with the least expensive version. 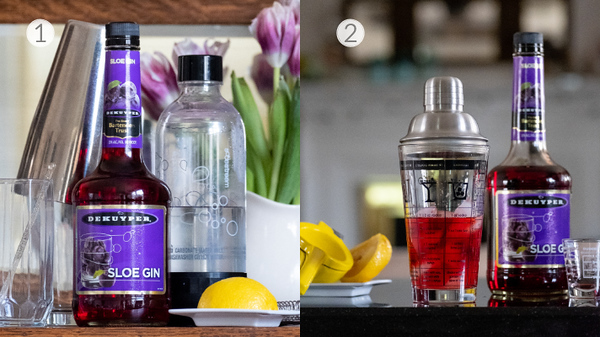 Step 1 – gather your ingredients – tall cocktail glass, sloe gin, carbonated water, and half a lemon. Step 2 – Fill a cocktail shaker with ice, squeeze the juice from half a lemon and add to shaker. Add 2 ounces of sloe gin to shaker. Shake for about 15 seconds. Step 3 – Add ice to a 12 ounce cocktail glass and strain mixture into it. Use a fine mesh strainer if you want to remove the bits of lemon. Step 4 – Top with sparkling carbonated water (we make ours with a Soda Stream.) Stir and enjoy. If you want to take yourself down a Google rabbit hole, try and figure out the difference between a Fizz and a Collins. I have a very old copy of a Trader Vic’s Cocktail book and it has the differences as: A Collins – lemon juice, sloe gin and carbonated water, A Fizz – lemon juice, sloe gin, simple syrup and club soda. The consensus today seems to be that many bartenders don’t differentiate between the two. In searching, I found this article on the Differences between a Fizz and a Collins. They basically have the same ingredients, they are just treated differently. 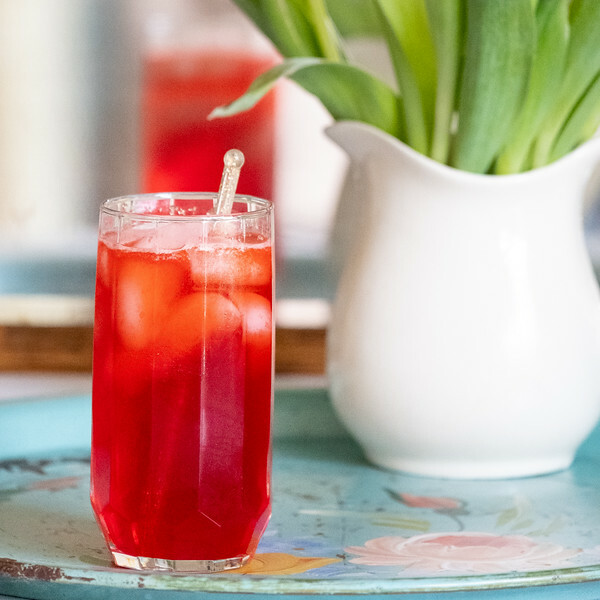 Whatever you call this cocktail, it’s just right for when you want a pretty cocktail! 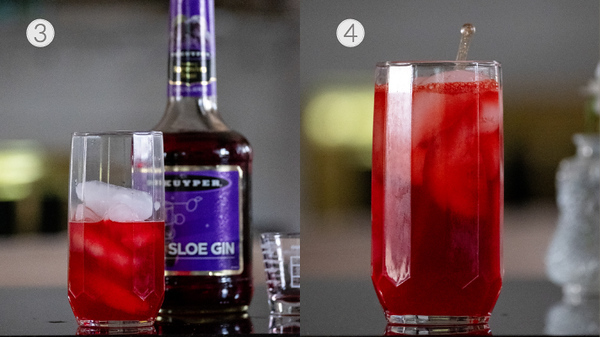 Whether you call this a Sloe Gin Fizz or a Sloe Gin Collins - it's a pretty low alcohol cocktail perfect for easy drinking! Add ice to a tall cocktail glass and to a cocktail shaker. Pour lemon juice and sloe gin into cocktail shaker and shake for 15 seconds. Add sparkling water to cocktail glass. Stir and enjoy. Use a 12 ounce cocktail glass. If you use a more expensive sloe gin, it will be higher in alcohol. Use a finer mesh strainer if you do not want any of the lemon flesh in your cocktail - it's a little prettier without it. This look very pretty! Beautiful photos! Like you, I’m a bit of a lightweight, so I really do appreciate lower alcohol content in this ruby cocktail. I’ve never tried sloe gin before, but I’ll be on the lookout for it now. It looks like the perfect weekend sipper! This looks fabulous! I love a new fun drink to try. Woww there is no doubt that we learn new things every day never heard before of Sloe gin now I need to go and buy me a bottle, your cocktail ideas sound so good! Ooh yum, I love a cocktail and actually have a bottle of sloe gin in the cupboard that I didn’t know what to do with…. but I do now!